Southern Ontario got hit by a large amount of snow this week which inspired me to write this post on Snow Shovelling Faux Pas that I’ve been sitting on for months now. No matter where you live, if it gets snow, this post is directed to you. I dislike snow, mostly because it makes it hard to get around. If it could snow ONLY on the grass, I’d be happy. Unfortunately that is just not possible. It’s the job of the residents and businesses to take care of the snow on the sidewalks in front of their buildings. Many (if not all) cities even have laws regarding when or how the snow should be cleared. That doesn’t mean that those rules are closely followed though or that anything is really done when they are not. Maybe you always shovel your sidewalk within 24 hours of a snow and you follow all your cities rules and ordinances so you think you are doing your part and maybe you are. However there are some ways of shoveling snow that while not exactly against any rules, make it just as hard if not harder to get around. 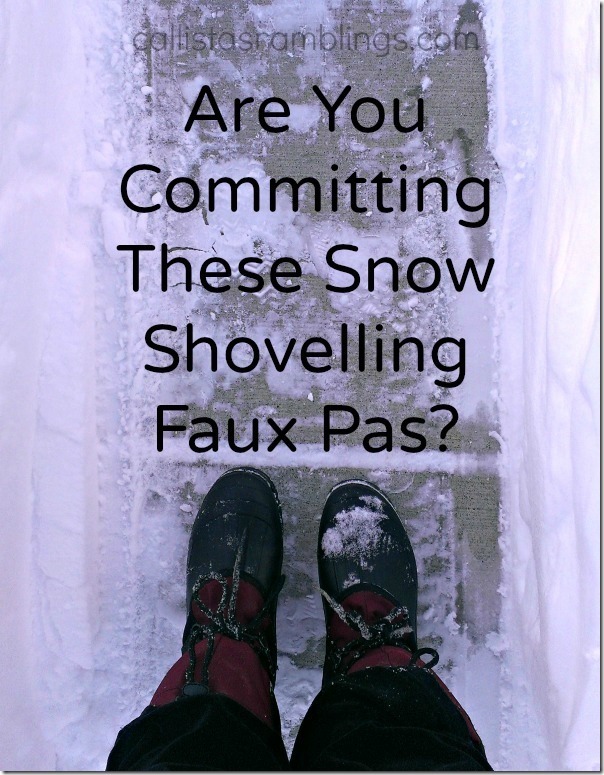 Are you committing these snow shovelling faux pas? If you are, PLEASE consider shovelling more thoroughly and carefully in the future. Thanks. The goal of shovelling snow is so that people can get through safely! Not just the average well-abled adult but also the parent with a stroller or wagon and the person with a riding cart, cane or walker. It’s not a difficult science but there is more to it than just removing some snow. Maybe when you looked at the image at the top of the post, you thought it looked shovelled to you. You may or may not have been able to notice from the photo but the person who shovelled didn’t shovel the full width of the sidewalk, but only a foot or so across. This is enough for most people to walk through, but isn’t enough for a stroller or assisted walking device. 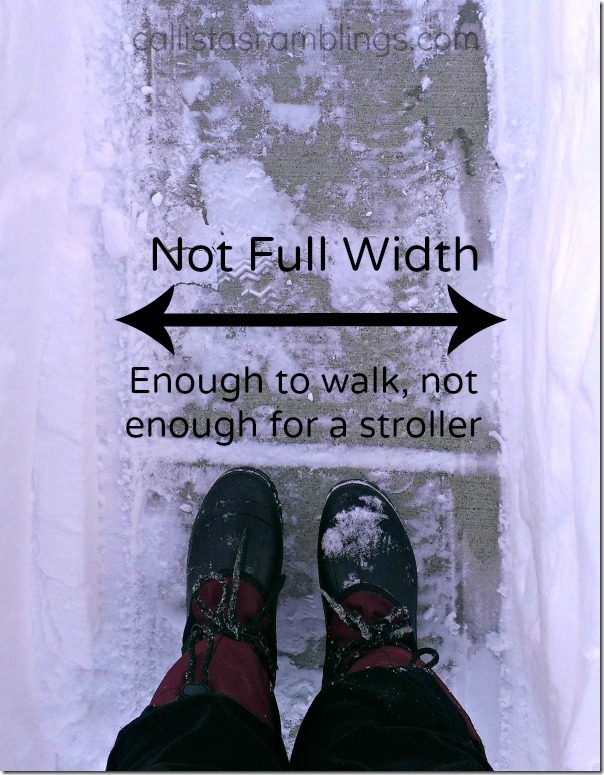 When I have to try to push my stroller through this, one wheel is on the sidewalk while the other pushes through the deep snow on the side which also pushes the snow back ONTO the sidewalk. I understand shovelling is hard, especially for those with certain health conditions or of a certain age but not shovelling properly causes other people undue hardship and possible health or safety problems. If you are unable to shovel properly, PLEASE enlist the help of a neighbour, friend or family member. In the image below, the sidewalk was shovelled the full width of the sidewalk, but not all the way through to the bottom. 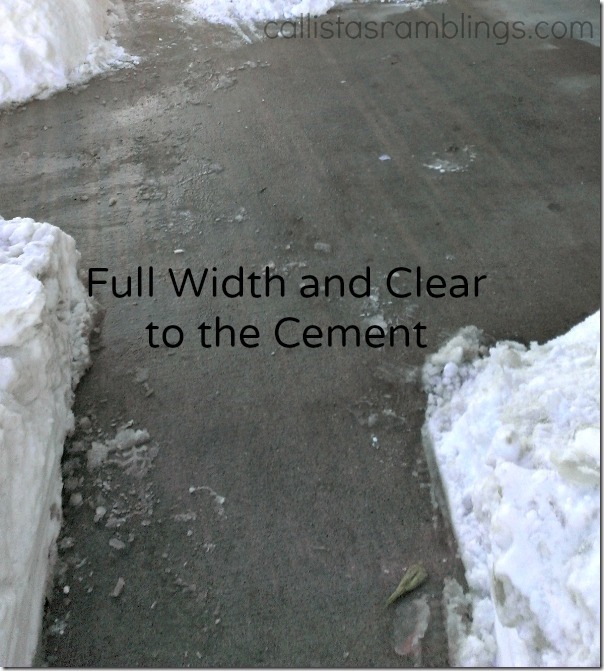 If you can’t shovel all the way to the cement underneath you should be adding rock salt which will melt the rest of the snow and ice. In fact, even if you do shovel all the way, adding rock salt can melt any ice that’s left and if it snows lightly, it will melt the snow as it falls eliminating the need to shovel again so soon. Many times I’ve come across a sidewalk that looks fully shovelled but is really one large sheet of ice because salt wasn’t added. If you live somewhere that gets snow, even just once a year, you should own a shovel and stock up on rock salt. 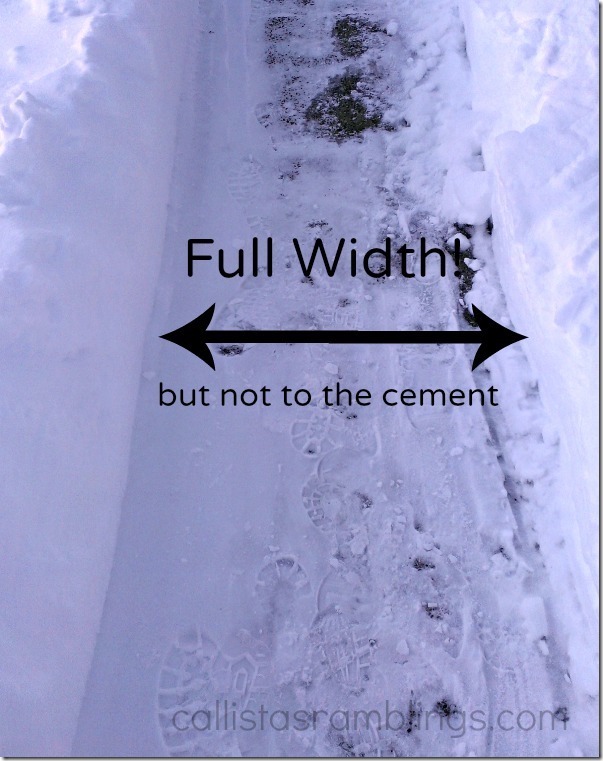 Please get your sidewalk cleared as soon as possible and clear it full width and to the cement. Add rock salt to eliminate extra snow and ice. Every parent who pushes a stroller or person who walks with an assistive device thanks you.